Fresh off a Stage 7 win in the 1 week tour of Pakistan, a 1648km stage race, Matt Usborne of Team BH/Integrale showed he had plenty of reciprocal fitness to take the Category A race in the Comox Cup Series. Usborne (BH/Integrale), Gabriel Reid, Fred Hodgson (BH/Integrale), Wade Christie (CVCC), and John van der Vliet (CVCC) formed a breakaway group midway through the 80+ Km race and managed to hold their lead to the finish. The lead group completed the race in 2 h 5 min. giving them an average pace of 40 km/h. The chase group was lead by local riders Andy Everson, Rick Chorneyko, Mike Wood, Phil Schum and Mort Allingham finishing in that order only a few minutes later. Sunday's race was sponsored by Black's Cycles of Comox and proved to be the largest field for the first of the CVCC Cup series with 37 riders signing up to race the Tsolum River Road/Headquarters loop. Les Black and staff marshaled all corners and the race, under the guidance of Gord Giesbrecht, went off without a hitch. Even the rain held off. The 60+ Km Category B race, was won by Kenji Jackson in 1:35. For the first time in many years, the Cat. B and A riders left at the same time which proved a benefit to the faster B riders who stayed with the A group. The ten riders then formed their own race within a race to the finish as the A riders in the group sat up to let the B sprint take place. Category C riders raced 40 km. Gord Giesbrecht was first with Ernie Klassen second. Nick Holatko was the youngest rider in that group and he took third place beating his father Frank to the finish. This year marks the return of the Cadets (riders under 12) with Jordan Duncan and Jake van der Vliet completing two laps of the course to finish their race in 43 min. 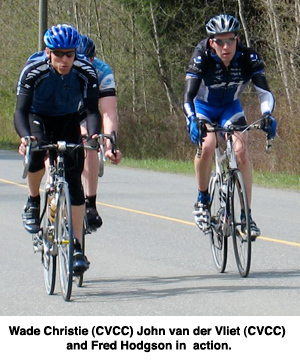 Comox Cup #2 Race will be held in Cumberland May 6.